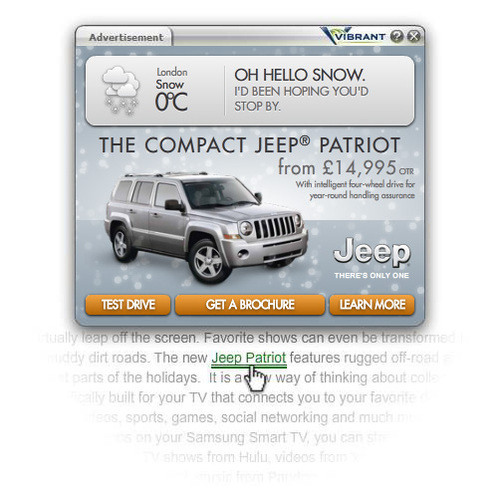 Vibrant, the global leader in premium contextual advertising, launches a new campaign for the Jeep brand, Compact Jeep® Patriot using a real time API weather feed linked to the IP location of the user to rev up drivers who love the challenges of the UK weather. The Vibrant ads integrate with Jeep’s print and online campaign, which target would-be Jeep drivers who aspire to have the off-road proficiencies to tackle any meteorological upset, due to their all-weather capabilities. The UK campaign is due to run until 22 December. The innovation, an in-text global media first, features IP targeting which places the user geographically and, together with an API feed from World Weather Online, enables the in-text creative unit to be updated and co-ordinated, in real-time, with the local weather.